Handcrafted from contented cattle that died naturally out on the range. Even if you can find another shop that sells natural rib bones, there's no telling what size or shape instruments they'll send you. That's what sets Bone Dry Music apart from the rest. We do our best to avoid surprises when you open the box. That's why we offer you so many choices...so you have more control over what you get. Here's what we want you to say when you get your order, "Yep, that's pretty much what I was expecting." Mix n' match. Honeycomb instruments are great sounding easy-to-grip bones at a bargain price. Mix n' match. 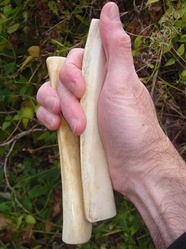 Flat rib is easy to hold and grip. Mix n' match. Conical ribs give you the best of both worlds: Flat at one end, round at the other. Mix n' match. Semiconical ribs are flat bones with attitude. Mix n' match. Humpy ribs are cool and funky. These sultry bones ooze with character. Mix n' match. Flat & heavy rib is heavy, bulky and delivers resonant sound. 10,000-year-old extinct bison ribs from The Ice Age. Now this is what you call an old-time musical instrument! Rattlin' 8 rib bones (4 in each hand) with ragtime pianist Rich Egan playing "Salome's Slow Drag" by Brun Campbell. Recorded April 3, 2011 during the monthly Ragtime Rendezvous at Dressel's Pub, Saint Louis, Missouri.